The Encounter with the "Other"
Underwater among the dolphins, we find ourselves to be the clumsy ones, the ones who do not belong here, but have come for visit. We stare, wide-eyed, at the grace and weightless power of the dolphins as they spin, turn, flip over, and proceed in a new direction before we could tell they were going elsewhere. They glide and turn, the smallest flicker of their pectoral fins guiding them into a new pattern, a weaving of balance and freedom and desire, their goals fleeting, their aims simple. We are among Elders, beings who live as one with their world, adjusting their very flexible selves to whatever comes their way. They communicate their ideas quickly, so quickly. Above our hearing, far above mostly, they whistle and click to each other, offering suggestions and comments to each other -- or do they? What do we know of the content of their communication? 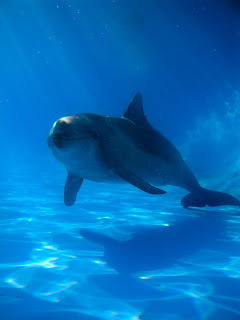 When we study closely the communication of the dolphins, we find that they can respond well to whatever we ask them to, whether it be counting, memory games, sorting words into correct order to accomplish complex tasks, or giving each other instructions on how to do something the other has not ever done before. They can do whatever we ask of them. Yet we do not know what they talk about among themselves. Since we know they are capable of whatever we imagine for them to try, is it not reasonable to imagine that they can communicate in ways we have not asked of them? Do they speak with a noun-based language? Or are they mostly useing verbs, the moving actions of life to base their language? Or is it of another order altogether? Perhaps the mysterious languages spoken by initiates of arcane studies, who must constuct whole vocabularies to express their occult knowledge is akin to the dolphin's speech. Do they carry on metaphysical exchanges, telling each other of dimensions unknown to us? What is the cause of the ease, the sense of gentle peace they radiate so much of the time? Do they know something so well that it leaves them knowing not the unease we seem to live within, but somehow know some of the reasons "why" life is as it is? Do their millions of years of living free in the oceans, mostly without fear, give them a transcendental reality, one of deep and abiding trust? I wonder many times when among them, how they see us. Their gentle knowing seems so wise, so free of entanglement in our "stories". They can serve as our teachers if we choose. They can represent The Other, the outside being who sees us and reflects an image of the self back to us, if we approach them with respect. Pet owners who flush used cat litter down the lavatory may be responsible for the deaths of whales, dolphins and porpoises around Britain's coast, according to academics and public health experts. They have found evidence of a common parasite in dead marine mammals and say family cats could be be the unwitting source. 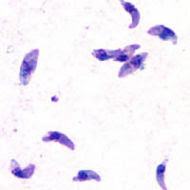 Cats are essential to the life cycle of toxoplasma gondii, which can infect most mammals and birds but only as part of the food chain. The possible link to dolphin deaths has been raised by staff from Swansea and Glamorgan universities and the National Public Health Service for Wales in a letter to the Veterinary Record. They say that in California concern that cat faeces have contributed to sea otter deaths has led to disposal warnings on bags of cat litter. But little is known about infection in marine species around Britain. Blood samples from dead stranded cetaceans revealed infection in one in 70 harbour porpoises, in six of 21 common dolphins and in the only hump-backed whale tested. Nearly one in eight Swansea University and health service employees admitted flushing cat litter away. During the first few weeks, the infection typically causes a mild flu-like illness or no illness. After the first few weeks of infection have passed, the parasite rarely causes any symptoms in otherwise healthy adults. However, people with a weakened immune system, such as those infected with HIV, may become seriously ill, and it can occasionally be fatal. The parasite can cause encephalitis (inflammation of the brain) and neurologic diseases and can affect the heart, liver, and eyes (chorioretinitis). In a startling reversal of what most people seem to feel, a CNN QuickVote poll, taken on February 12, 2007, revealed a disturbing attitude among internet users. Of 19,256 votes cast, 12,060 (63%) stated that "it's fin-tastic (sic)", the proposition that "dolphins and sea lions (be used for) security at a naval base". Of those same 19,256 voters, only 7,196 (37%) stated that "it's a shipwreck (sic)". 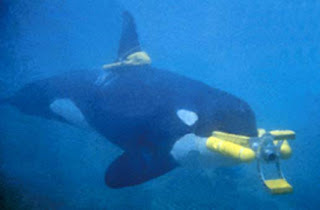 The US Navy, until the beginning of the current war in Iraq, was very secretive about their use of marine mammals as soldiers. Perceiving the huge increase in "patriotism" as an opportunity to gain pubic support for the old programs, suddenly the Navy began posting large amounts of information on the net about the use of dolphins. There is a monthly desktop "wallpaper calendar" you can download from the Navy dolphin program site. There are powerpoint presentations listing how many species have been tested for their usefulness. 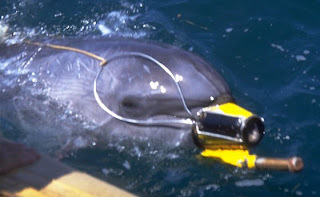 Images are available of dolphins carrying sophisticated underwater devices, presumably for detecting mines, etc. There are interior shots of the specialized ships built to deploy dolphins into combat zones....and the list goes on. How have we moved so far backward in our appreciation for the other form of self-aware, highly developed, compassionate and friendly life on our planet? Clearly, there is much more work to be done to educate the public, helping them to know dolphins and whales as individuals, and as our constant friends and benefactors. During the age prior to Antarctic whaling, the abundance of krill, the small shrimp-like creatures who were the whales major food source, was immense. Reports from the earliest sailors to venture far south repeatedly spoke of "vast pastures", of "pea-soup concentrations of the Euphausia (krill) as far as the eye can see", etc. Krill feeds upon phytoplankton, the tiny ocean plants that are the most productive source of oxygen for our planet. Does this surprise you? Many people believe that the rainforests are the major source of oxygen. This is true for land-based sources, but we must recall that the oceans cover over two-thirds of our planet and the phytoplankton bloom each year is beyond our ability to envision. Literally billions of tons of phytoplankton grows into vast floating mats of plantlife, creating huge rising clouds of oxygen. Krill eat the phytoplankton, and baleen whales eat the krill. 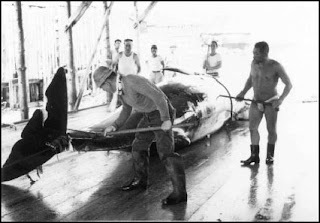 Normal sense tells us that when the whales were removed from the southern seas in the world's most concentrated slaughter ever known, over a period of about one hundred years, that the food they fed upon would increase dramatically. Yet, this does not seem to be the case. In a paper recently published in "Evolutionary Ecology Research", Volume 9: pages 651–662, written by Jay Willis of the University of Tasmania (Australia), the conclusion states that, paradoxically, the krill abundance has dropped, probably caused by a lifestyle change due to the absence of feeding pressure upon them. With less krill, the phytoplankton blooms have become unstable, leading to some years of huge over-production of bio-mass, which then releases hydrogen sulfide and methane into the atmosphere as it rots, uneaten. These two gases are among the worst of the Greenhouse Gases, which are culprits in Climate Change. For the ancient peoples of the world, Whales were known as "Keepers of the Breath", and "The maker of the air". Now we know that the wisdom of our ancestors was more accurate than we imagined. The killing of whales is a crime against all life, as well as an insensitive and cruel anachronism, left over from less enlightened times. Do you hear, Japan, Norway, Iceland, N. Korea, and the whaling pirates? Please, for our mutual future, stop all whaling. It is a matter of life and breath.